Catch Zeus if you can! The great Greek god has bolted from Mount Olympus and it?s up to you to nab this dashing deity. Play cards strategically, adding numbers as you climb up the mythic mountain. Grab Zeus when the total reaches a multiple of 10. Better yet, summon the strength of Apollo, Poseidon, or all-powerful Hera to bring Zeus within your grasp. 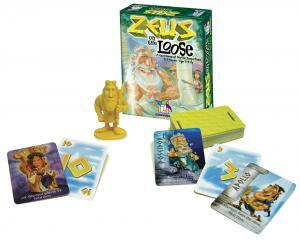 Reach the top of Mount Olympus with Zeus in hand and you?re a mortal among the gods. To play is human. To win, divine!